Our powder coated aluminum black 6x6 post caps are ideal for anyone who is looking for a cost-effective and practical way to protect their wooden fence posts. Our 6x6 black aluminum post caps aren’t only functional; they will give your wood fence a beautiful decorative touch that enhances the overall appeal of both your fence and your property. The slim profile of our metal post caps makes them a versatile choice for fence posts and varying home and landscape architectural styles. A simple installation of two screws in pre-drilled inserts on the side of each cap..
Aluminum will outlast any wood product! The beauty of a classic design like the one that we’ve come up with for our black 6x6 post caps will turn a dull, uninspired, very ordinary fence, deck, or porch railing into elegant and sophisticated looking and distinctive one. It will seem like a design feature that is and always should have been a component of the landscape design of your property. All wooden fences take a beating from anything and everything that Mother Nature unleashes. The posts support the slats and the top and bottom frame that hold the fence together. The better shape your fence posts are in, the longer the fence is likely to last. 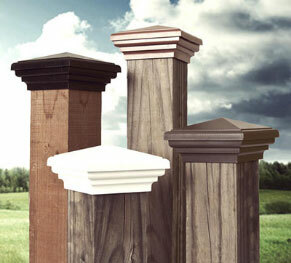 Our metal post caps are made from powder-coated die-cast aluminum. Every purchase of one of our black 6x6 post caps comes with a one year guarantee against fading. Our 6x6 black aluminum fence post caps come in two sizes: Nominal (or Standard), and Actual (or True.) The nominal size fits standard posts measuring 5.5” x 5.5”, and the actual size fits posts whose true measurements are 6” x 6”. Aluminum fence post caps will outlast your wooden fence because metal isn’t subject to contraction and expansion, a common phenomenon with wood fence slats, posts, and post caps. The repeated instances of pushing and pulling hasten the rate at which the wood will weaken, but metal post caps can minimize the impact of that and lengthen the lifespan of the wooden parts of your fence or deck railing. Our black 6x6 post caps will never require any maintenance. Aluminum post caps are easy to install. All you have to do is screw the two screws into the wood through the holes on the side of the post cap. Once they are tightened, your metal post caps are there to stay forever. *Aluminum caps are not produced in the US. *1 year warranty against fading.